Economic profit does not occur in perfect competition in long run equilibrium; if it did, there would be an incentive for new firms to enter the industry, aided by a lack of barriers to entry until there was no longer any economic profit. As new firms enter the industry, they increase the supply of the product available in the market, and these new firms are forced to charge a lower price to entice consumers to buy the additional supply these new firms are supplying as the firms all compete for customers (see Monopoly Profit § Persistence). Each individual firm can only produce at their aggregate production function. These functions are a calculation of possible outputs given inputs such as capital and labor. 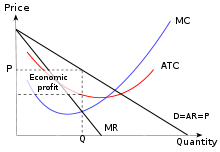 Once each firm's aggregate production function is equal, perfect competition exists and economic profit no longer occurs. Incumbent firms within the industry face losing their existing customers to the new firms entering the industry, and are therefore forced to lower their prices to match the lower prices set by the new firms. New firms will continue to enter the industry until the price of the product is lowered to the point that it is the same as the average cost of producing the product, and all of the economic profit disappears. When this happens, economic agents outside of the industry find no advantage to forming new firms that enter into the industry, the supply of the product stops increasing, and the price charged for the product stabilizes, settling into an equilibrium. This page was last edited on 26 April 2019, at 11:24 (UTC).